It's been a long time coming. Today, the World Trade Center's underground passageway opened, meaning that pedestrians can now travel between the WTC PATH station and Brookfield Place (formerly known as the World Financial Center) via tunnel. The bridge that linked the two sites was destroyed on 9/11, and commuters have had to cross busy, unpleasant West Street. 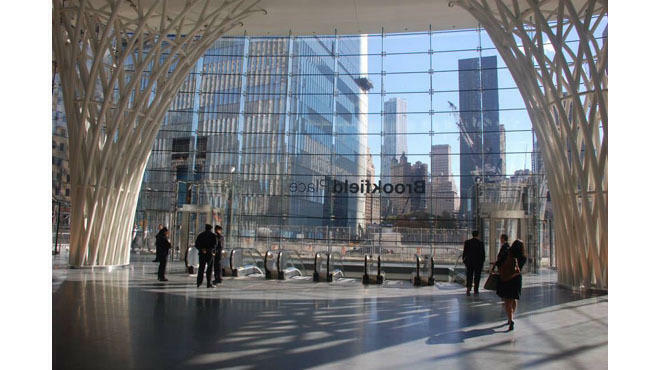 Brookfield Place, an 8,000-square-foot pavilion on Vesey Street, also opened today after a $50 million construction process; the glassed-in pedestrian link features Italian stone paving, two lattice-style columns made with a mile's worth of steel, and six 46-foot-high escalators to access the underground PATH station. Brookfield Place's $250 million renovation will also include luxury shops and restaurants. Click through the snapshots above for a first look at the shiny new facilities.